The party started in the town of Cillamar. The most significant news of the week was that Polly's custom (Fine Balanced Elven) longbow was finally ready, letting her kill things even more efficiently. Rumors included something called a grue that lives deep in dungeons and kills adventurers who don't carry lights, and the foul beasts under Castle Whiterock being the descendents of evil experiments by Ghorrene the Black Eagle, an imperial prince from hundreds of years back who was convicted of deviltry. Zaber still found no sign of Lord Flitwick or any of his servants, and his town house was dark. The weather was so cold that neither winter clothing nor a Warmth spell was enough; it required either both, or Arctic clothing. That kept most of Cillamar's population indoors near a fire, but wasn't enough to deter the PCs from bundling up, begging Seépravir for Warmth spells, and trekking the 30 miles to Castle Whiterock. For the first time, Lake Whiterock was frozen solid enough to appear to be safe to walk over. This caused a debate between the cautious types who would rather walk a couple of extra hours to avoid possibly falling through ice or being eaten by the lake hydra, and those would would rather get indoors sooner. For once, the brave won the argument, everyone walked across the lake (with Zaber in the lead wearing the Ring of Slow Fall and a rope around his waist to yank him out if he fell through, and Seépravir Levitating just in case), and nothing bad happened. 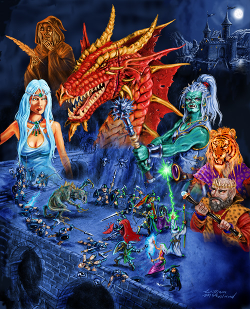 Once they reached Castle Whiterock, everyone huddled in the former Rust Spider tower (one of the few rooms on the surface level with intact walls and roof) to get out of the wind, while Seépravir rested a bit then cast dungeon spells: Dark Vision for 3/5 of the group, See Secrets and Invisibility on Zaber, etc. Then everyone headed down a level to the top of the secret elevator, then down the elevator to the underwater river level. It was significantly warmer that far down, enough that the river was still not quite frozen, though it was very close. Everyone except Zaber piled into a skiff, with Garreth rowing while Zaber (with the Rings of Swimming and Water Breathing and a Warmth spell) invisibly swam ahead, scouting. As they reached the first fork in the stream, a huge swarm of bats came around the corner and decided the four visible boaters looked like excellent sources of tasty warm blood. The huge swarm split into 4 hex-sided swarms, two of which randomly decided to get Polly, while the other two went after Garreth. That was somewhat fortunate for the PCs, as those two have the most HP, and Garreth has reasonable amounts of armor. The two swarms on Polly rolled very good damage, though, and were lucky enough to randomly hit her unarmored legs rather than her armored torso, so she bled a lot. Not enough to cause a major wound or a stun, so her Bless stayed up rather than being consumed to avert a hit. The two on Garreth barely managed to get any damage through his armor, so he was fine. Garreth smashed some bats using his long knife, though it was only mildly effective against Diffuse opponents. Zaber, in the water, mostly just watched for other attackers. Polly pulled out her edged rapier and also started swatting bats. Elias smashed bats with his flail and shield. Seépravir experimentally tried Death Vision on a swarm, not sure if it would work. It seemed to stun a few bats. There were still a lot of bats remaining. The remaining unstunned bat swarms flitted around, picking targets and hit locations and random (with a slight skew toward attacking the closest targets). One went for Seépravir's leg and cut it a bit. Her newly acquired winter clothing gave her DR1 versus cutting, which helped a little. Another swarm went for Polly's torso, the only place she has decent armor, and bounced off. (Bats are dumb.) The stunned swarm lost its turn, then recovered from stun. Garreth and Polly stabbed more bats. Elias squished and swatted more bats. Seépravir panicked and decided to use Shape Air as a deterrent to any bats approaching her, but it failed because of the combination of many spells on and the Shock penalty from getting bit. Zaber swam around looking for other enemies. One of the remaining bat swarms went for Elias's torso and bounced off his heavy armor. The other went for Seépravir and cut her some more. The Garreth and Polly's final attacks were enough to disperse the remaining swarms. Polly considered shooting non-threatening individual straggler bats, but made her roll to resist Bloodlust and decided it wasn't worth the arrows. With the battle won and Seépravir and Polly both bleeding heavily, Elias cast Stop Bleeding on everyone who was bleeding, and then Polly had a swig from the Wineskin of 26 Minor Healing Potions, turning it into the Wineskin of 25 Minor Healing Potions. Elias suggested boating to the nearby Hidden Fane of Justicia, whose high sanctity would let him cast Major Healing with a better chance of success (he was maintaining 4 Bless spells, a Flaming Weapon, and a Resist Fire for -6 to spells), but everyone was pretty much fully healed so Garreth instead kept going north. First they bypassed the giant clams by going through the rapids. Garreth made his boating roll to avoid hitting any rocks, and Polly threw some dead bats to the clams as they went by. Then Garreth piloted the boat down a small waterfall. Further downstream, they went past the illusionary wall, which Garreth spat at as they passed. Finally, they saw the beach ahead, with some stairs leading up, and another skiff moored there. Everyone got out of the boat and started up the stairs, but the stairs were very slippery. And then became very dark, at least for the 2 PCs without Dark Vision spells. Zaber and Polly made their DX rolls to get up the stairs despite the Grease spell, and then saw a couple of tents, a huge fire, and three derro (one regular sized and two extra large), two of them pointing crossbows at Polly. They both loosed, and Polly acrobatically dodged the first bolt and regularly dodged the second. At that point, the small derro which had just taken Polly's arrow threw something at Polly. It was a Concussion spell. Which Polly dodged easily, but which subjected everyone within 10 yards to a HT-3 roll to avoid stunning. That turned out to be all the PCs except Zaber. Seépravir failed her roll, but her Bless prevented the stun, and expired. Garreth, Polly, and Elias all made their rolls. The two huge derro re-readied their repeating crossbows, very quickly. Zaber, still Invisible, ran up behind one of the crossbow derro into backstab position. It failed its hearing roll to notice him. Polly shot the derro wizard again, and this time it rolled an 18 on its blocking spell. Oops! I didn't bother going to the critical spell failure table until I saw if it was already dead. The arrow did enough damage for two more death checks, but the tough little wizard made all its rolls. Then Polly put another arrow into the wizard, which brought it to -5 * HP, and it was dead with no rolls allowed. Seépravir stopped maintaining a couple of spells (she casts some spells with 1 second duration so that she can quickly drop them when needed) to reduce her penalty, then managed to put Dark Vision on Garreth. Garreth made his DX check and started running up the stairs toward the huge derro with crossbows. They both shot at Polly again. The first one hit, but she acrobatically dodged. The second one rolled a critical hit, for double damage, which caused Polly's Bless spell to decide that this was a good time to expire and save her from being impaled. The derro, seeing his absolutely perfect shot somehow miss, started screaming in Undercommon that it was time to destroy the sun so that it would stop cursing him. Zaber backstabbed the nearby derro in the neck, and hit, but rolled horrible damage and barely penetrated its mail armor. He decided not to use his Luck to reroll the damage, saving it for defense. Polly shot the other derro (not wanting to risk hitting Zaber if she missed the one next to him) and knocked him out, non-fatally. The one that Zaber just stabbed dropped her crossbow, fast-drew her shortsword, and tried to stab Zaber, but he made his acrobatics roll and then his acrobatic retreating dodge roll. Garreth threw a brightly glowing (full-power Continual Light) sai at Zaber's derro as he ran up, but missed. The derro didn't seem to like the light, though. Zaber tried another neck attack, but the derro parried. Polly shot the derro, it failed to dodge, and was knocked out, leaving two unconscious huge derro warriors and a dead regular-size derro wizard. Somehow, both Garreth and Polly made their bloodlust rolls and decided not to murder the derro. Instead, they tied them up, and started looting. The loot included magic bracers, mail armor, shortswords, repeating crossbows, a potion, a few coins, and a key. Zaber searched one tent and found some silk pillows and silver drinkware. Garreth searched the other tent and found a pewter incense burner shaped like a dragon. Elias cast Bless (only +1) on Seépravir, and then she cast Seek Magic. It told her the nearest magic (other than what they already had on them) was a bit to the southwest, back across the river. She tried again with Seek Earth, looking for gold. This found some gold under the tent that Garreth had searched. Zaber searched harder, and found a small locked chest under the tent. Its lock opened with the key from the wizard's boot, and it contained a lot of coins, some small gold ingots, and a single gray boot. Polly wanted a Bless too, but Elias rolled a 17. Fortunately he hadn't used his Luck, so he got to try again and nobody got turned into a newt. Seépravir determined that the single boot was magic, and wondered why her Seek Magic hadn't found it. Meanwhile, one of the bleeding derro woke up, and Garreth started interrogating him. He found out that the dead wizard was named Nalloth, that the boss was named The Impressario, and that they were all dead meat for killing Nalloth. Also that The Impressario ran an arena called the Bleak Theater where monsters killed each other, and that slaves had been taken there, until the flow of slaves stopped for some reason. At this point the derro passed out from blood loss. Elias said that he refused to use holy healing powers on monsters, but deigned to use mundane Esoteric Medicine to keep the prisoner from bleeding to death. At that point Garreth switched to interrogating the female derro, learning that no dragons had been seen in the Bleak Arena lately but a two-headed giant had. And that derro really hate the sun and it would burn their eyes out if they went to the surface. She offered to show them all of Nalloth's treasure if Garreth would let them go, then went into the tent and found an incense box that had been missed, then said "oh you already dug up his chest." At this point the PCs had a discussion about whether to take the derro back to town, but they decided it was probably true that sunlight would kill them, so they just let them go. They went back to Cillamar, using the "it's too late for wandering monsters" rule. The bat swarms were a random encounter, and they did some serious damage, due to a combination of good damage rolls, good random targeting rolls, and the party's lack of good anti-swarm attacks. But nobody died, and the combination of Stop Bleeding spells and healing potions meant they were ready to go again. The derro wizard had a nice ambush set up, with Darkness and Grease and Concussion ready to go, but Dark Vision is a nice counter to Darkness, and Polly is a pretty good counter to anything that dies from impaling damage. She dodged all the bolts fired at her except the one critical hit, her Bless averted that one, and that was it for the derro. Clearly whoever's in charge should have place more than 3 derro there to stop 5 PCs. Once again the party decided to go back to town after winning one real fight, rather than pressing on. This kind of slow progress has worked well for them so far, but it might backfire at some point, if they ever fight anyone smart enough to use the time to regroup and reinforce.